The layout and architecture of Luang Prabang exhibit a unique blend of French and Southeast Asian influences. The Wat Xieng Thong Temple in Luang Prabang, Laos. Luang Prabang is a city located in the northern mountain ranges of Laos, close to where the Nam Khan and Mekong Rivers meet. It is comprised of 58 surrounding villages, and 33 of these are part of a UNESCO World Heritage Site. The recorded history of this site dates back to the 7th Century when it was known as Muang Sua. This city was an important stop along the Silk Road and served as the capital of the Lane Xang kingdom between the 14th and 16th Centuries. During this time, it was renamed Luang Prabang (also known as Luangphabang) after a statue of Buddha and it became the point from which Theravada Buddhism was spread throughout the kingdom. The Lane Xang kingdom fell in 1707 and the city was made the capital of the new Kingdom of Luang Phrabang. After several decades of political unrest and fighting, France annexed the region and Luang Prabang became a French Protectorate in 1893. France recognized the city as an important royal and religious capital. It held this role until 1946 when Vientiane became the capital. Today, Luang Prabang is an important site due to its architectural, religious, and cultural significance through history. 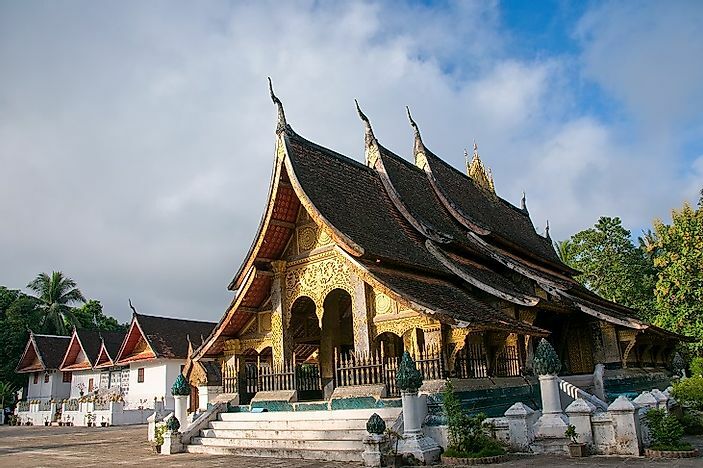 It displays a mix of rural and urban lifestyles as well as traditional Laos and French colonial architecture. This city continues to be an important religious center and is full of Buddhist temples and monks. Tourists come from all over the world to visit Luang Prabang. This site offers a wide variety of activities. Visitors can tour some or all of the 32 temples here, take the 300-step staircase to the top of Mount Phousi, or stroll through the jungle to the Kuang Si waterfall. Other activities include elephant rides, visiting the local market and the Haw Kham Royal Palace Museum, and boat rides down the Mekong river. A visit to this UNESCO World Heritage Site gives tourists the opportunity to learn about the local Hmong culture and life of the Buddhist monks that walk the streets for alms every morning. As previously mentioned, this site is protected on the UNESCO World Heritage list due to its architectural importance, which in turn reflects both its cultural and religious heritage. Luang Prabang provides a look at the development of a Southeast Asian human settlement over the course of several centuries. It displays a fusion of ancient and modern lifestyles that continue to work together today. Most of the buildings here are of traditional regional styles, being made of wood and bamboo. The Buddhist temples however are made of stone and are embellished with intricate carvings. Additionally, Buddhist pagodas can be found everywhere. These buildings are ornately decorated with sculptures, paintings, furniture, and engravings. Many French colonial houses, made of brick with wooden balconies, are scattered along the main street that runs through the city. The city sits at the confluence of two rivers on a peninsula that juts into their mingling waters. These rivers play an important role in the city today, both for transportation and trade. Luang Prabang is bordered by mountains and rich, green jungles. In addition, the landscape is dotted with waterfalls, pools of turquoise waters, and wetlands. These wetlands, consisting of fish farms and plots of agriculture, blend into the natural surroundings. Although the majority of this area is protected as a UNESCO World Heritage Site, Luang Prabang still faces significant threats to its preservation. The biggest threat is in urban development which is taking place in order to keep up with the growing population size and increasing tourism industry. Some of the traditional buildings have been converted for commercial use and much of the ongoing construction is illegal. This construction no longer uses traditional materials as cement has become more affordable and readily available. These modern materials threaten the authentic environment of the city. The Ministry of National Education and Sports, the Information and Culture Service, and the Law on Environmental Protection are responsible for the conservation efforts at this site. These efforts are regulated by the city’s Safeguarding and Enhancement Plan. Local leaders of the Buddhist religion are also involved in preserving their cultural and religious heritage.